Every substance interacts with light in a different way. Knowing these interactions allows us to figure out of what are composed the materials we are looking at. Thus, in a visible light spectrum chlorophyll in plants absorbs red and blue light while reflecting a wide range of green light that gives plants their characteristic color. Also, a dry soil is brighter (more reflective) than a wet one. These properties allow for detection of various properties of both: surface and atmospheric features from space, such as the density of plant life (by capturing bandwidths characteristic for chlorophyll), logging (comparing the change in amount of vegetation over time) or mapping for disaster management (such as exact mapping of areas affected by flooding or conditions existing in a possible habitats for malaria-transmitting mosquitoes). In a graph above you can see a spectrogram – the way light is reflected in a range of wavelengths from a substance – of chlorophyll (green) with an overlaid wavelengths captured by Sentinel-2’s Multispectral Instrument (blue vertical lines). Note that the reflectance of chlorophyll suddenly rises up to over 700nm – this is called the red edge, and satellites often use it to distinguish vegetation from other sources, as does Sentinel-2 by using bands marked as B05 and B06. 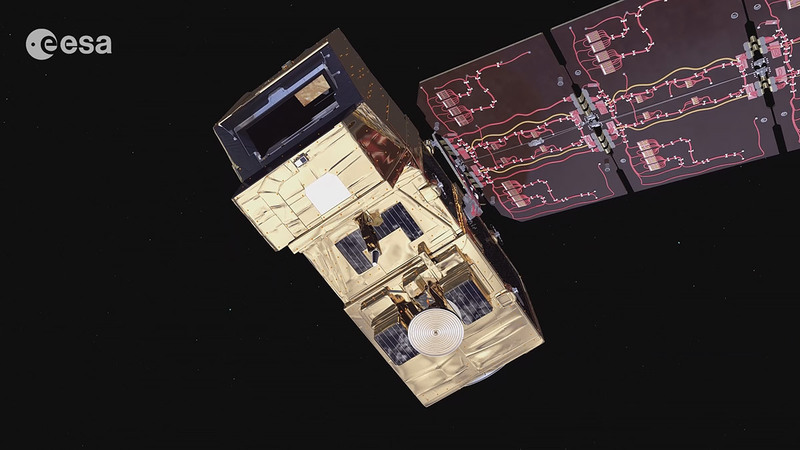 The best example of spectroscopy in space that is used for every-day applications is MultiSpectral Instrument (MSI) onboard European Space Agency’s Sentinel-2 satellites (pictured right). Taking the whole top part of the satellite, this telescope captures 13 spectral bands corresponding to the various ways in which ground and the atmosphere reflects light coming from the sun. 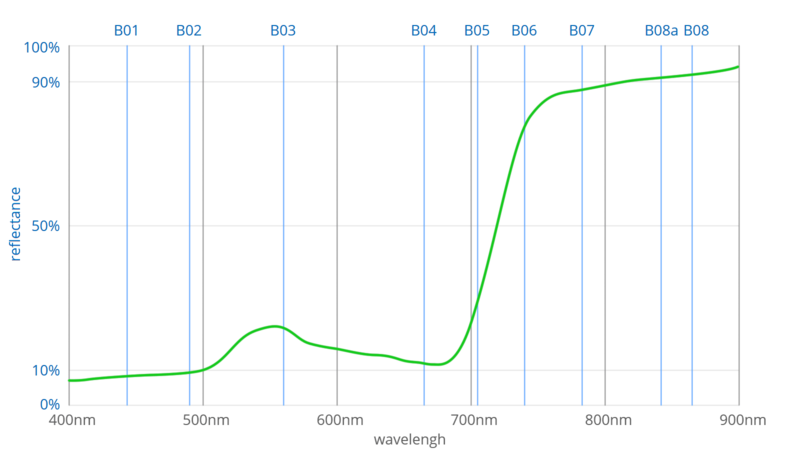 Fundamental construction of the MultiSpectral Instrument is quite simple: It is made of 3 large mirrors that focus light, beam splitter that splits light between two sets of sensors: one for visible light to near-infrared, and another for short-wave infrared*. Each sensor has multiple filters that allow only a specific bandwidths of light to pass through – much like a color filter array in a camera. This design allows for a simultaneous capture of multiple, specific, narrow bandwidths of light over the same area at the same time. Orbiting sensors capture long stripes, which are 290 km wide, constantly looking vertically down. This allows single satellite to capture almost entire surface of the Earth in the span of 5 days, and Sentinel-2 operates in due time. First satellite, called Sentinel-2A, was launched in June 2015, while the second one just recently, in March 2017. This means that your house is photographed by one of the Sentinels-2 every two and a half day! Data collected by the satellite are then sent to the ESA’s ground stations uncompressed in one of the data centres and processed. This kind of processing is not very much different from what can be done in Adobe Lightroom or in dedicated software for astrophotography – it’s all about creating scientifically useful data from raw bits received by the ground stations. You can find more info about Sentinel-2 processing levels on ESA’s Earth Observation website. Final data can be accessed online through Copernicus Access Hub – website requires a free registration. * – First set of sensors are CMOS for visible and NIR light,- this type of sensor can be found in every modern camera, like in smartphone. Second set of sensors are special mercury cadmium telluride (HgCdTe) sensors for a short-wave infrared, as silicon-based sensors are not sensitive to these wavelengths.